Monarch Summit II is a popular 55+ community located in Laguna Niguel, California. This beautiful community was built from 1976 to 1977 and is comprised of 190 low-maintenance homes. Residents socialize at the clubhouse and adore the outdoor pool and spa. With spectacular ocean, coastal and valley views from atop the Niguel Hill, residents love to call Monarch Summit II home. Monarch Summit s clubhouse is where residents can relax, mingle, play, exercise and celebrate. An event room hosts community events, card tables are where impromptu games of poker take place, and a catering kitchen allows residents to enjoy a dinner with friends and neighbors. Residents can also enjoy the beautiful year-round Southern California climate by taking a dip in the outdoor pool and basking in the sun on the patio. Its close proximity to the beach allows coastal views and pleasant breezes. 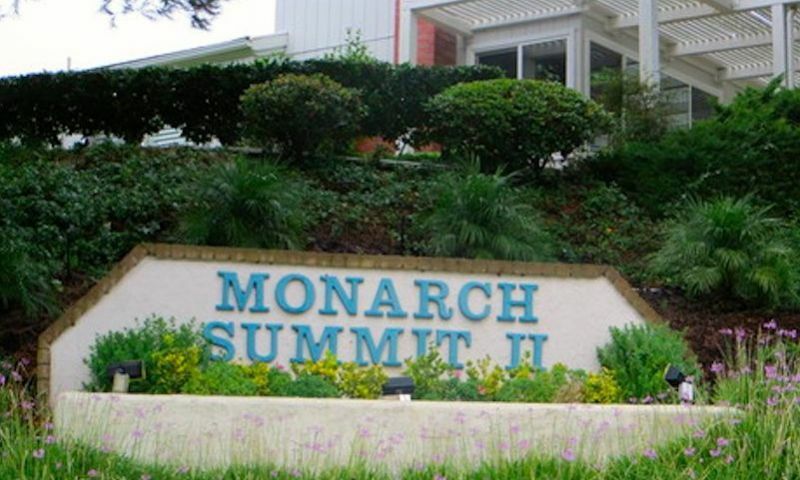 Monarch Summit II embraces a total of 190 attached homes situated on a high coastal ridge. There are three distinct floor plans ranging in size from 1,400 to nearly 1,700 square feet. All of the homes are single story and feature two bedrooms, two bathrooms and an attached two-car garage. Active adults love these homes because they offer open living space, single-level layouts and require very low maintenance. Many of the homes boast terrific features like private covered courtyards, bamboo flooring, incredible ocean views, and vaulted ceilings. Monarch Summit II is a 55+ community built on Niguel Hill overlooking the Pacific Ocean where it enjoys a pleasant Mediterranean climate. This hidden gem that is tucked away at the top of the hill provides residents with a sense of privacy. It allows residents to enjoy the serenity while also delivering a welcoming atmosphere. Residents have fun-filled get-togethers and the options to visit with old friends and welcome new ones. Although there is not an activities director homeowners get together and play games such as cards, table tennis and billiards. Exploring the natural lands nearby keeps residents active while embracing nature's beauty. Residents at Monarch Summit II will also have more time to explore their own interests thanks to the homeowners' association (HOA). The HOA fee covers roof, exterior and common area maintenance as well as trash removal. Monarch Summit II is perfectly situated atop Pacific Island Drive in Laguna Niguel. It is about halfway between Los Angeles and San Diego, bounded by Route 5 and the Pacifica Coast Highway. Just up the street is the Le Niguel Country Club, offering 18 holes of Championship golf across 7,060 acres of lush, rolling hills and meandering creeks. Nearby, residents can explore some of nature s beauty at the Aliso and Wood Canyons Regional Park, Laguna Niguel Lake, Laguna Niguel Regional Park, and Niguel Botanical Preserve. For shopping excursions, The Shops at Mission Viejo mall is about six miles away while Crown Valley Mall is close-at-hand for everyday needs. Highway 73 and Interstate 405 are close by, making cross-state trips very convenient while John Wayne Airport is less than twenty miles away. For additional flying needs, Los Angeles International Airport is approximately sixty miles away. For the best in active adult oceanfront communities, look no further than Monarch Summit II in Laguna Niguel, California. Check back soon for more information on the lifestyle in Monarch Summit II. Monarch Summit II embraces a total of 190 attached homes situated on a high coastal ridge. There are three distinct floor plans ranging in size from approximately 1,400 to nearly 1,700 square feet. All of the homes are single story and feature at least two bedrooms, two bathrooms and an attached two-car garage. Active adults love these homes because they offer open living space, single-level layouts and require very low maintenance. Nice location and a good value if you're up for some remodeling. The homes here have a nice look to them yet most need some TLC. If you can do things on your own (or at least have the vision) then this would be a great investment. Location is typically everything and here you're about halfway between LA and San Diego, also close to the ocean with new views too. I purchased and completed remodeled a home here over the last year and although it's been a lot of work, it was well worth it. 55places.com is not affiliated with the developer(s) or homeowners association of Monarch Summit II. The information you submit is distributed to a 55places.com Partner Agent, who is a licensed real estate agent. The information regarding Monarch Summit II has not been verified or approved by the developer or homeowners association. Please verify all information prior to purchasing. 55places.com is not responsible for any errors regarding the information displayed on this website.